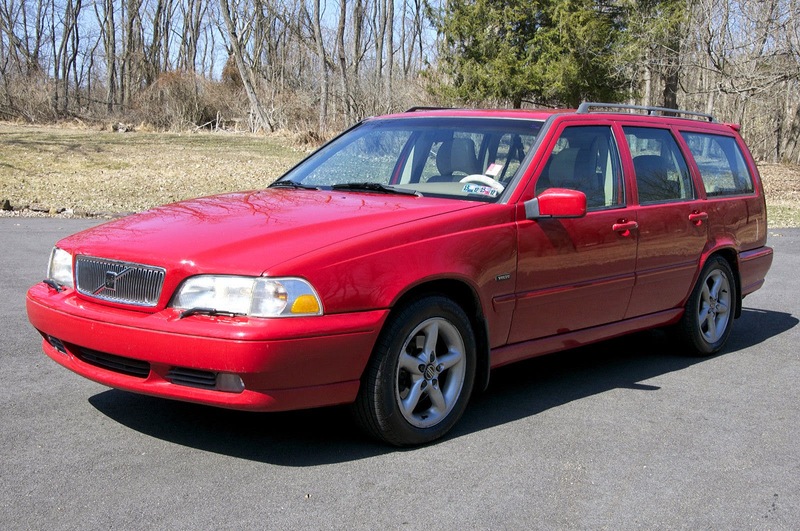 The best I could find on a quick sweep of all-wheel-drive wagons on eBay is this 1998 Volvo V70 AWD offered here on eBay currently bidding for $1,325 with a few hours to go. A quick disclosure, I know of several wealthy Volvo mechanics who have sent kids to dental school on fixing late model Volvo issues -- BUT if you are handy with a Haynes Manual, metric spanners, and the internet, you can fix any problem that crops up with reasonable costs. And the problems will appear, small issues as the Swedish built wagon depreciates farther into junk yard territory. Of course the ABS light is permanently illuminated in this one --the seller assures us that the brakes are strong, just don't expect any anti locking action anytime soon. What would you suggest for Mrs Gianni? I have had a V50 for 8 years and 120k on the dial with only a brake job at 100k and a 800.00 timing belt next. The T5 version has 4 wheel drive and a turdo. My non turdo gets 32 mpg on the highway at always above 80 mph. Just a thought.. I dislike Subies. Hee hee. You said turdo. Potty humor is funny. And the V50 is awesome - far better than the fancy-pants 3/Focus you'd think it would be. That's actually a marvelous suggestion, Tom! Just my two cents here, but unless you are driving on seriously unmaintained trails, think about whether AWD is necessary. Up here in the snow belt, I just run proper snow tires with FWD, and I frequently drive around AWD vehicles. Now, if you live somewhere where you can't use snow tires for the rest of the week when you are not skiing, then maybe the equation works out differently. +1 for snow tires! I'm ALWAYS driving around AWD and 4WD in my FWD Shadowagon and it's all due to the proper tireage. We run a full set of Blizzaks on the Turd-ota, but for skiing 4WD/AWD is necessary. On Snoqualmie Pass, the WSDOT is very conservative and throws "Chains required, except for 4WD" when it isn't necessary in my opinion. The WSP sets up a checkpoint when this happens, so you can't just drive by. I have hit my limit with the chaining up stuff so daughter can make her ski team practice and son can make his snowboard instructor gig, so I am all in with the AWD requirement. Yep, OK. I can understand that. Clearly you are "one who gets it". I only brought it up because I have some friends who think AWD is some sort of a miracle that allows you to violate the laws of physics. Around here, the saying is "AWD allows you to have your inevitable accident at a much higher rate of speed". Ha ha ha ha...FTB, you're the BEST! But surprisingly, NO. A Volvo would probably not be the best for the G-man and his family. Even an R, which would be my first suggestion, you'd think. I'll explain my thinking later (I'm actually really busy at the moment). Before I go off all half...uh...male-chickened, can I get a rough idea of your budget, Mr. G? Remember, this is for your much better half...she deserves the best for what she must surely put up with on a daily basis (just kidding)! Oops, I just realized I forgot to add that piece of *very* important information. $25K-ish,as much as it pains my inner Scotsman. She probably deserves much more ;-)! Frankly, that's HUGE money in my tiny world. You're going to have a lot of really nice vehicles to choose from. I know, I still live in the world of the $1,000 Alfetta. The only expensive repair has been the alternator and it was miserable. Not bad for 9 yrs and 155K miles. You're not kidding about "several wealthy Volvo mechanics who have sent kids to dental school on fixing late model Volvo issues." I've had a 2004 V70R for nearly 5 years. Though it had 85K miles, and I was fully apprised of the angle gear and other potential issues, the complete dealer servicing history and favorable pricing (no Infiniti dealer wanted to sell a stick-shift wagon) swayed me to pull the trigger. In 5 years, I have had to put in $10K in maintenance. Yes, $10K. Nearly the entire cost of the thing. While the timing belt and water pump were expected, it all went wrong. Angle gear went, clutch slave cylinder had to be replaced (along with the while-you're-in-there clutch), drive shaft, 2 wheel bearings, haldex coupling, HID ballast, and so forth. Along with typical maintenance. All the work was performed by reasonable independents/dealer mechanics working off hours. It was to be expected, given that 85K is typically when parts designed to last the warranty begin to fail, but having to put in roughly $2K a year in maintenance has generally put me off to buying another Volvo. I'll keep this one as long as it drives as it feels as though we've been through some saga together. This is just my own anecdotal experience with a particularly specialized model. However, it may be more economical in the long run to go for the Subaru, like a Legacy GT Wagon or the aforementioned Forester. Perhaps an E46 iX wagon or Vibe/Matrix AWD. The rare but stylish Mazda 6 wagon? The secret to the R is that you buy the first gen. There are lots of reasons why you'd want a 98 if you want to avoid the "little things" that are so common in the modern Volvo. The first gen smooth bumpers are less fragile than the 850 and have less doodads and stuff that goes kablooey than the latter. What you give up is arguably better style, more power (easily fixed) and age, of course. All just my opinion (based on meticulously and obsessively gathering data), of course. But that's why I own a 98. These are just some of the reasons why I think Mrs. G and fam will not be terribly happy with a Volvo. The XC is waaaay too big and mpg is not too pretty. The V50 is probably too small and we've already discussed the V70. Because we aren't allowed to know (COME ON ALREADY, G-MAN!) the budget, the V60 is not even worth discussing. In fact, it's not even worth talking about any of it until that info is handed down from on high. May the heavens open up and the pertinent and much required details be delivered to us by the angels. Or better yet, get realistic and realize that the RWD in the Volvos are so FWD-biased that you skip the R and just buy a T5 and reflash the ECU. Hey wait, that sounds soooo familiar. What idiot would do such a thing? Sorry, I was stuck in a meeting... Maybe Vince can edit the original copy to put $25k for the budget. No need! That's perfect, thanks! I've got a list, but I need to trim it for budget. But first, your mention of a meeting has inspired a nap for me. Shouldn't we have a price range here? The Bentley Bentayga looks decent and fits most of your requirements, but it may not have a hitch. How about a 2007 Passat Wagon 4Motion? Don't forget the first rule of Lancia ownership! But I'd rather have the wagons I posted earlier. @rotten....funny you say that....my wife had the last-gen MDX also, and it pretty much did everything well, and even handled nicely (the SH-AWD worked magically to make it corner better than it ever deserved to). I still like her current Cayenne S better from a sporty standpoint, but at 20-25k for a certified pre-owned MDX, they're a relative bargain. CTS wagon = still worth too much. Might find an outlier, but there are so many other options I'd have to ask why. Unless the G family just had to have one. MDX = not very good mpg. Great vehicle and a good suggestion, they'd have to choose to accept the lower mpg in exchange for the greater luxury. But why when they could get an RDX? The current AWD model RDX gets 1MPG better than the current AWD model MDX. The FWD RDX gets the same MPG as the FWD MDX! http://www.fueleconomy.gov I'd get the MDX. It doesn't get good MPG, but the RDX gets horrible MPG for the size of vehicle it is. The CTS wagon I posted a link to is in the price we are looking at- what do you mean that it is worth too much? The Cadillac is pretty cool, I didn't even think of that. I can't see her driving it though. Her Scandinavian heritage would never let her be seen in something she'd consider so flashy. The MDX/RDX's are good candidates though. No, you're right Rottenland. It will take some searching, but a CTS wagon is a possibility. A 2010 AWD with the 3.6 is rated 18 mpg city. The issue with the MDX is less about mpg and more about size (more SUV-like), the RDX being obviously more compact. I think it's a great option, but there are roadblocks; Gianni doesn't really like modern Hondas, the size thing (granted, it might be too small), they're more likely to find a newer RDX at their price point and, finally and crucially, they're probably looking at at newest a 2010-2011 MDX which is rated (using your link) at 16 mpg city. An comparatively valued 2013 RDX with lower mileage gets 19 mpg city. That might not be a big enough of a difference to them, I don't know. Maybe it is, maybe it isn't. Here's where it gets interesting. If you compare the CTS, MDX and RDX "Unofficial MPG Estimates from Vehicle Owners" it goes (in order) 17/25/20 with the RDX unsurprisingly the top dog, albeit those numbers are culled from a very low number. She sounds like a keeper, G. You might consider it. Your wife, I mean. Problem with the later model RDX is that it lost the torque-vectoring SH-AWD system post restyle. That would be a dealbreaker---the system is that good and noticeable. Also, coming from a minivan I have to assume Mom would appreciate the three-row MDX. 3-row not specified as desired, but SUVness has been targeted as a negative. Would Mrs. G see the MDX as an SUV (crossover or not in reality)? Only she can answer that one. RDX issue solved easily - buy a first gen (and save $$). You're still only talking about a 2012 model (2 gen 2013+ of course). A 2013 could be a possibility, but it will most likely have high mileage. A 2012 with low mileage would make a lot more sense, superior AWD or no. Still, we're running into this Hondaphobic issue of G's again. If they'll consider the RDX it begs the question; why not the sibling CR-V? Other than the turbo and the luxury issues...it comes down to perceived image and that is often a deal busticator. Sadly. She won't consider the CRV. She says that is a grandma car. I've enjoyed driving the XC90s I've been in, but I'm otherwise less than impressed with the FWD-platform generation of Volvos. Regarding the V8, it's the second generation of the 60-degree Ford Taurus SHO V8. Die-cast open-deck block with siamesed bores (and bored out so far there's very little metal between the bores) viz the sand-cast closed-deck block of the Ford. Aside from the much larger bore all the other significant dimensions are identical - bore spacing, deck height, bearing sizes, rod length, balance-shaft location, etc. Never compared 'em but for all I know the crank and rods might be identical. All the externals are different, of course. When it comes to Scoobys you'll hear head-gasket horror stories, some models with transmission problems, etc. E39 5-series wagon or an E53 X5? It'd be my choice not because it's trouble-free but because I know how to deal with everything that'd go wrong with it. Tahoe/Yukon/Suburban, even the '00-06ish GMT800 models? Big stuff lasts forever, little stuff breaks and wears out. I think my wife only stays married to me for my Suburban. When its for the Mrs. leave the subie WRC cars at home or listen to her complain about how it just doesn't sound right. What about an E320 or E350 4matic wagon? Good size, comfortable, reasonable fuel efficiency. An excellent suggestion. Given that this would be part of a gearhead household, then the higher maintenance and ownership costs might be acceptable. But only the G family could make that call. Exactly what the Beezy family has been looking for, which HB might have been recalling since we talked about just a couple of weeks ago. My research tells me '01 or '02 is the sweet spot, and even in the nicest one you'd get $15k change back on your $25k bill. True. Doesn't make them the best option, though. And because they should be naturally aspirated engined models, why? There's no really great reason other than it might be the perfect size. That's really the only reason why Mrs. G might find one to be the best for her. ~ Would I be off-base to presume that the first things to check in this permanently illuminated ABS light problem are the wheel sensors? Likely the ABS computer. Use a popsicle stick between the ABS computer body and the plug, that'll typically make the light go away (and yes, retain ABS function). Or have it repaired for ~$90. In 300k miles on my winter-beater S70 I've never replaced a wheel sensor but I have replaced the ABS computer (once...). Having owned 2x Legacy GT wagons from the turbocharged era, I can't stomp my feet and yell loud enough that if you plan on owning a car past 70k miles, you're better off with something that isn't a Subaru. Doubly so if you live in a place where it snows. Why, oh why doesn't Mazda bring the Mazda 6 wagon to the 'states? If they did, I'd be driving that instead of our snoozefest CX-5. Speaking of CX-5's, those are things that exist. Ours brand spankin' new was $19k and some change out the door. Handles wonderfully for something as portly as it is. Carries momentum really well around corners... and you'll need all of the momentum you can spare, because acceleration is what I would generously describe as "leisurely". Not generously, I would describe the acceleration as "early 70's non turbo diesel Benz towing a large trailer full of rocks". In mixed 60/40 hwy/city we see 31mpg between fill ups and despite the astronomical CR of the skyactiv mill, it takes 87 octane. Of concern in your case would probably be the dog crate, however. The rakish angle of the rear hatch glass and tapered greenhouse where it meets the D pillar means that the only boxes that fit back there are of the short, flat variety. Example: this weekend I went out and bought a new lawnmower from Home Depot. It comes in a box that's 4x3x2 LxWxH and I had to fold the seats down because even sideways, it wouldn't allow the rear hatch to close. Approximate measurement from the top of the rear seatback to the edge of the rear hatch with the hatch closed is 2.5'. Put another way, our jogging stroller when folded flat fits transversely, but not longitudinally. We also looked at the CX-9 but it was a bit out of our price and size range. Steer clear of the CX-7 if you like longevity. You could also go with a CPO 4Runner if you wanted more space at a similar price point. Honda Pilot, Toyota Highlander would also fit the bill if she's looking for something more car-like. Oh and if you're looking to get rid of a persistent smell in a car, use Ozium. 1/2 a small can of that over the course of a weekend took my RX-8 interior smell from "gentlemen's club meets ash tray" to lemon-fresh. And it lasted at least until I sold it 9 months later. I think you and I have had this exact same conversation before, except 90k miles was the point of no return on our old Outbacks. I concurred then, and I still do. +1 on the -1 for the forced induction Subies. Discussed many times here on DT before. Not a great choice. We got the Mazda6 wagon, but no AWD. Off the list. CX-5 would be an excellent choice. CX-9, 4Runner, Pilot, Highlander...mpg too low, that's why they aren't on my Primo list. The 4Runner is too truck-y and the other are probably too SUV-like for Mrs. G. Just a guess, but with so many other excellent options why go there. I really liked the CX-5 *if* we had to go the SUV route - I'm pretty disappointed that a dog crate won't fit int he back. We feel that the dogs are safer in crates vs. rattling around in the back with just a dog guard. K2MC, we got the Mazda6 Wagon, sure, back in the day. Not currently. If they shipped the *current* 6 wagon here, I'd be happily plodding along in the cheapest one of those you can buy. Instead, I'm happily plodding along in the cheapest CX-5 you can buy. The service writer at the Subaru dealership where I had a $13,000 ticket taken care of under warranty on my first 2005 LGT Wagon has remained in touch. About once a quarter we gripe at each other about the new crop of Subarus. They like to eat oil and piston rings, the solution is thicker weight oil with more frequent changes... which brings MPG's from high 20's to mid 20's. They also used an inferior material on the rod bearings iirc on their newer 2.0l engines. High rate of failure from what he tells me. I've done all of zero googling on this issue, so if someone has more accurate info, feel free to correct me. On a positive note, from what he tells me the CVT on some of early 2009-2010 Outbacks is a stout unit. Also from what I can tell, the 6 cyl engine is a peach but I think it might fall out of the MPG and price range that Mrs. G is looking for. @ RyanM - do you think you could get something 24"W x 36"L x 27" H in the back of the CX-5 sideways? Last comment, on the AWD versions of the 98-2000 S/V/XC70, the easiest way to replace the in tank pump is, wait for it, waaaaaaaiiiiiiittttttt for it.... cut through the floor... Otherwise, you have to drop the rear subframe. Yee haw. Another reason for the G family to cross them off the list. Firstly, let’s just acknowledge that it’s highly unlikely that you guys are going to buy any of the vehicles on this list. There, that’s out of the way. Secondly, are you absolutely positive Mrs. G really understands that by ditching the minivan format she loses the worlds’ most utilitarian suburban vehicle ever invented? It might be worthwhile just going and driving some of the below cars so that she really gets a feel for what she’s going to give up. Thirdly, the fact that you have two dogs is awesome to me. Dogs rule, end of sentence. Fourthly, I acknowledge that you don’t really like Hondas all that much and I’m not really mentioning any vehicle already discussed at some length. That doesn’t mean I don’t think they would make good options. You’ll notice that I haven’t included any VW or Audi vehicles. If you want one of those, I can’t help you and you’re on your own. Lastly, my first thought would be the RAV4 and the Venza, both with a V6. That’s where I’d start showing cars to my wife, given the specs. But that’s just me. I didn't look at anything in your "Primo" class because when I had dogs they were huge, but I now picture a 60lb dog fitting just fine. From the Primo list I would pick the CX-5, but I'd wish I bought a wagon. This Manual 535 XiT is pretty perfect, but we don't know if Mrs. Gianni wants to row her own gears. I do like the Lincoln MKT, as they seem to be rare and depreciated heavily. Wow, I knew you guys would come up with a great list! She can shift for herself, but she prefers not to day to day. Also, we don't need towing, the hitch is just for a bike rack. She doesn't want to lift her road bike up onto a roof rack. Right now, she can put her bike in the back of the Turd-ota. I read you on the mini-van, but there is nothing mini about our generation of Sienna, and the new one is even bigger! It is nice however being able to take out the second row seats and put 8ft 2x4's and 4x8 sheets of plywood in the back and close the tailgate. I think it is funny when I do that at Crap Depot and the guys with the 4 door personal use pickups can't even fit them in their short box. She won't go for the CR-V or the RAV4. She thinks they are for empty nesters (we're not there yet). I wonder if a dog crate would fit in the back of an Element? I'm not against Honda's. My first car that had just my name on the title was an '87 CRX Si, so I tend to look at the current Hondas thru that lens. I was also thinking VW, but we had a B4 Passat Wagon before the Sienna and she wasn't too impressed by it. Of course her car previous to that was a Alfa 164. G, The Element is awesome inside. Jump seats fold into the walls for larger items, otherwise a large crate will fit aft of the rear seats. I don't *remember* if there's a middle seatbelt in the Element though, so you'd be stuck at 4 max occupancy. Not sure if it's still an issue, but our company car went through rear brakes like it was going out of style. Other than that... it was awesome. I mean, super, SUPER nerdy on the outside, but like the Aztek, super SUPER useful inside. I've never met a boring person who drove an Element. Regarding the R, they're just flat-out junk. We've had one in the family (it's NOT MY FAULT) and I've known several other people with them. While I'm sure there are outliers, these have to be one of the worst made cars of all time. I kid you not. Worse than a Daihatsu Charade and a billion times the price! They're lovely and drive fantastically. But you don't see that many because they die like the POSs that they are. MB should recall ALL of them out of shame. Here's a typical owner experience. You'll have to check out the Element to see what you guys think, G. One option may be to go to a harness and ditch the crate. Honda even made a "Dog Friendly Package" for the Element, believe it or not! These are funky vehicles that make great dog cars (Rubber floors! Just like the white room where I live!). We have several friends that haul their large dogs around in them. The rear seats fold up against the walls like the old Previa and Landcruiser. Brilliant. If you need more space, you'll need more vehicle. That's too bad about the CR-V and RAV4. They're both spectacular CUVs, for what they are. Just marvelous. Sadly, they don't rust like your old CRX did. I know that's upsetting. I hear your pain, brother. VW...you're on your own. Good luck. I will not be blamed for any shenanigans that may result from the following video. My Aussie would chew thru the harness! Once I leashed my Siberian up and tied the other end to a banister post so she wouldn't sneak off and be naughty. My Aussie went over and chewed thru the leash to free her. I'm surprised he hasn't figured out how to open a crate. Some dogs are certainly tricky. You might consider trying a couple of different types. Or you might try the metal bars that separate the back from the seats. Those work really well. I made the one in my wife's MPV. Still, the secured crate is the best best. MB R was another one we thought we might look at. I'll steer clear based on this input. Thx K2. Basically we are looking for a 3-row wagon with FWD or AWD, which is a pretty limited choice. Rented a Volvo wagon one time and found the ergonomics didn't suit me. You're not really asking me about 3-row vehicles are you? Do you poke bears with a stick to see if they're awake? Let's admit that many of the cars above are not a Dude's Choice. If I had $25k to spend, I'd be very tempted by an Audi A4 wagon from Carmax, with a Carmax warranty. All of the benefits of an Audi, and someone else pays for the maintenance. Yes, I read Doug DeMuro. I mentioned this on DT a while back on another thread, but I bought my3 kids all a 2008 Mazda5 in 2010. They have trashed them and all have over 100k miles on them with nothing but tires and brakes an oil....nothing. They go like snot, and the highway has always been above 32mpg. They are the sport model and they actually handle very well. They changed motors in 2010 to a 2.5 which is slower and less gas mileage, but I still love the flexibility of use. I never have 4 wheel drive because it as a false security here in northern Ohio I put 4 snows on my 318 TI and never have a problem. Tom is right. For your budget, you'll be getting a brand new vehicle (never my choice, but...). The only thing you can't get on the Mazda5 is AWD. So...there's that. Hey Tom, I tried to follow my (and your) own advice when shopping for the CX-5. We tracked down three manual trans 5 Sports with the 2.0 engine all CPO. Without fail every last one of them had rear suspension creek / pop / camber issues. The dealership we eventually bought the CX-5 from replaced about $1200 worth of rear suspension bits on the Mazda5 M/T Sport they had on their lot and it still felt like the rear end was disconnected from the front. It was really disconcerting. And it still had a "pop" every time you hit the brakes while backing up. I was suuuuuper bummed because that M/T was a hoot to drive. They actually de-CPO'd the ones I test drove after being unable to fix the rear suspension issues within budget. The one I'd used prior to this had none of the rear suspension issues that the CPO cars had when I test drove them. Bad batch maybe? All were silver and had a build date within 2 months of each other... coincidence? Unfortunately no 4WD/AWD is a non starter for me, since I'm the one that gets to chain up when chains are required on Snoqualmie Pass for non-AWD/4WD. Can't really compare Ohio with the WA mountain passes. For the price of two great used ones, maybe you glue them together and get 4WD. Capital idea! Do you get NWD if you glue together the two back halves? Aw geez, I never should have suggested it...next up is probably some ridiculous engine swap, too. Will the madness never end. Swedish heritage you say? What about the Saab 9-3 TurboX wagon? Once you love a Saab you always love 'em. Unless I missed it, there's also the Acura ZDX. built on the Pilot/MDX platform instead of the Accord (like the Cross Tour), and can be had w/ Acura SH-AWD? Not to mention lots of luxury goodies. I'd dive this, the Infiniti (FX or EX), and the Venza. If you wade into SUV territory I'd give the Lexus GX470 a once-over. ZDX = compromised trunk, which is most likely incompatible with dog crate. GX (and sibling 4Runner) = SUV no go, as per Mrs. G.
FX and EX models = less desirable 13-16 mpg city, so prob a no go there too. A true (unlike the Chebby I listed) Saab would be a personal choice for the G family. I will not be held responsible for nor any part of such reckless behavior. Why you tryin' to steal my thunder, Rottenland? Heh heh. Only kidding. But I did already list this car and its sibling the SRX. Not much feedback from the G-man, so I'm thinking it's probably not really in the running. The fact that the 9-4X was built in Mexico is also likely not a big plus, nor does the 457 produced make for appealing long term ownership and let's just not even mention the 15 mpg city for the 2.8 turbo, 17 mpg city for the 3.0. Add all of that to the long list of why this may not be the perfect G-car and I think we haven't found a winner in the Theta Preemies. I think some of that may appeal to the G-man's reptile gearhead mind, but if Mrs. G finds out that she's going to be driving a car from a deceased (moribund at best) brand, there will be mutiny. over that Saab, though, wouldn't you. Same platform, but the reviews decided that the SRX was the better vehicle than the Saab. Better engine, better suspension set-up. Didn't notice you posted the 9-4x earlier. The Scandinavian wife got my mind focused. And how could you not find the correct vehicle? You posted everything, even Mitsubishi's. Who knew they still sold cars other than the EVO? Depends wearing little ladies who drink crystal light drive SRX's. I'd stick to the Saab. Nobody drive the Saab! Not sure if we want to do the orphan marque thing again. We did that with the 164. Bought it new in '91, then Alfa dropped the mic in '95. 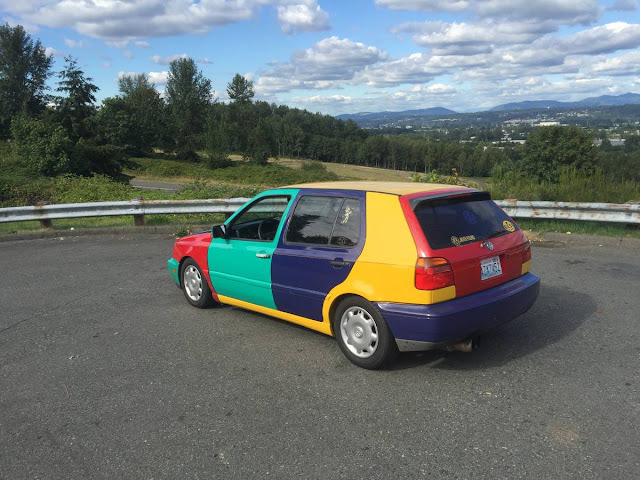 It wasn't too bad at first, but by 2000 it was a pain getting parts from ARDONA and the local Alfa shops drew the line at the Milano, so it was Ferrari of Seattle for me. They are nice guys, but I was the worst dressed customer at the service desk. @Rottenland - ha ha! Yep, Mitsu's still here, though it's moribund too. I don't think you could describe SRX drivers any more accurately. Spot on! Still, I've actually considered one. The kicker for me is that the trunk bumper is too tall. It's too high for my dogs to jump in. You'd think having tall dogs that wouldn't be an issue. But they get old and arthritic. Then I'm forced to lift a 90 pound dog in and out of a vehicle and everywhere else. My back has decided that we're not going to do that any longer. The reason you don't see any 9-4Xs is because of all the reasons I listed (none sold, mainly) and we'll see less and less of them as time goes on. They're highly unlikely to ever be a collector item too. All of which adds up to highly interesting for me, frankly! But not for the G family. @Gianni - Yep, totally agree with you on the 164. That is exactly the way it went, whether we all liked it or not. There are so many reasons she wouldn't like the 9-4X. But who knows. Have you guys had a chance to test drive any cars to add or knock them off the list yet? And careful there, Rottenland...you're talkin' about G's wife. We gotta respect the SSO (Significantly Smarter Other) at all times! @K2 - Not yet. The incident with the dog happened late last week. I was assigned the job of coming up with the list after being given the parameters. I lasted about 10 minutes on Almonds.com before I got distracted by their early preview drive of the ND Miata. But, I knew the perfect place where I could get others to do my work and come up with a list! So, I'm going to put the list in Excel and present it to Mrs. G. Probably won't start get started with the test drives until week after next. Next week is Spring Break so we are headed out of town. I may walk over to the VW./Subaru dealer at lunch today. I think they may have a used Element on the lot. I want to check out the back and see if it will hold Yogi's crate. @Rottenland - Is that you bidding on that Sprint GT on that other site? Squirrel! ADD rules. You're welcome to take full credit for any work I did. I would expect no less. Let us know how it goes! @Gianni- Yes, I am on that other site bidding and dreaming. I was prepared to bid higher than my starting bid, but it's already soared past my limit (I thought that wouldn't happen until next Wednesday). I'd have to sell my other fun car to fund the Gardenia White one, but I can't do that in a week. Too bad, as that is a great example of one of my favorite cars. I was already plotting my trip home from Missouri too. It will be interesting to see where it ends up next Wednesday. It looks like a really original step nose. I have this cars younger brother, a '73 115.01. I've owned it for over 23 years, When I bought it, it was just a used car i probably paid too much for. It was quite a trip driving it back to Seattle from Cupertino in January. I love your car too. After reading the details of the other car, it looks like I need to find one without all the rare Alfa bits that this one still has to keep it in my price range. Is "Edmonds.com" anything like Almonds.com? What a bunch of nuts on that website. Milton's not here, man. Sorry. Don't blame Vince, that spelling error was mine. What's freaky is that if you type in edmonds you'll still go to edmunds. Clearly, even they know they picked a stupid name. Just a little fun at your expense. Sorry! I never, eber mak a tipo kuz I'm purfct. I recently replaced the family silver B5.5 Passat 1.8t Avant with an argent '07 Honda Pilot w/70k. Patrice's straight up comfortable utilitarian sublimity was over @ 160k when electrics (airbag light included) moistened while suspension went rough, ignition nastified, turbo seals and vacuum hits dried up, and initially nice interior rubbed off. I hate it when ugly plastic chrome trim gets uglier. Pilotfeels like a Honda, but plenty of go juice (vtek yo?) and quite useful. It says 4wd on the back tübüt! 4X8 sheets all day! Mine was 8g's under G's budget, but perhaps some of that can go to dynamat; Heidi doesn't have Patrice's Teutonic vaultishness. Don't look at a car like this if you want to save $17,000. It's about a 3/4 the size of the Sierra, tons more fun to drive and has the functional interior space of the family G-yota. Drawbacks: the Ford V6 needs all of the ignition coils replaced because they're a stupid design (once done it's no longer a problem). While not as bad as the older Honda ATs, the transmission in the MPV is not known for longevity. Problem crop up when you start feeling the noticeably hard shifts. But at this price, you can swap in a new/used one and it's not a terrible job. A decent used AT runs about $1K on eBay. That particular car would need some decent wheels, stat. But these babies really do have "Zoom-zoom", for what they are. I find the steering to be quite artificial and light, but I'm used to nearly caveman levels. 4 passengers + dog crate- Oh, we got one! Towing + roof rack- Yes, on a roll! Car-like handling- For a van, yes! Ha ha! No, you're absolutely right Rottenland. The MPV fails in many ways. But if you read what G's written in the main copy, you'd realize he and I are like souls in our insane desire to save a penny instead of a dollar. It's just that we're talking our wives now and that changes EVERYTHING. I typically spend at least 2-3 times on a car for her than I would on myself. Why? Because wiiiiiiiiife. When the wife is happy, life is happy. And I like happy. I would happily slip on the chains for you guys if I get the chance to hang out with you and your family, G! You guys sound like super cool folks AND you snowboard! I've never been snowboarding in my life. The last time I was on the slopes, they were still making skis out of wood. I think there were a few wooly mammoths, too. Have you considered just renting an SUV when you guys need it? That's maybe more of a hassle than you want but it would allow your wife to drive a FWD or RWD vehicle daily. Just a suggestion. Prob not the best one for you guys. Plunk down $25K down payment on a NEW Ford Flex 3.5 EcoBoost AWD for the ultimate sleeper. The interior is perfect. Visibility is great. Pity the poor Suby drivers on the dry pavement stretches being toasted by a Flex. If you buy a new car I will disown you, G.
Rene is absolutely correct that the Flex is a fantastic vehicle. That's IF your wife likes the look - which is a BIG if. Some folks really seem to hate it. I love it, frankly, and would be interested in buying one when they lose even more value. But if you buy new you might as well just go out back, put your money in a barrel and set it on fire. Buying a new car is one of the dumbest things a person can do these days. Ever. That and buying a haunted house that whispers and the walls bleed. It's a toss-up. To me, it's equivalent of playing Russian roulette with a fully loaded gun aimed at your foot. Yep, you just shot yourself in the foot alright. Smart. But if she's interested in a Flex (which I listed and heartily endorse), then you're probably looking at a 2008-2011 (CPO) with somewhere around 40-70K+ miles. The EcoBoost came online 2010+, of course. Fantastic vehicles. The only spec it doesn't meet is the mpg, at 16 city (for the EcoBoost). It also doesn't have a very high H-point, which might bother your wife. Test drive!!!! Wow, a lot of comments here. I am just about to finish up my ownership experience with a 2005 Volvo S60 R (same running gear as the V70 R wagon). My wife and I are both gear heads so a manual transmission was a must. I went through the spline sleeve, Haldex unit issue that causes loss of AWD. Fortunately I have a friend who is a Haldex executive who called Sweden HQ for me and got the real skinny. I blogged about the experience, but the bottom line solution is at the bottom of the article so you can skip down and not read my babble: http://automissive.blogspot.com/2014/07/volvo-s60-rrrrrgggghhh.html. In essence, I loved the performance of the Volvo and even found the mechanical bits easy to work on (timing belt change was easier than on my Miata) but you must buy Volvo parts if you don't want to do the same job twice and everything costs $200-$400 minimum. Also, the car has the turning circle of a semi truck, it takes a three point maneuver to pull into a normal parking space. The front tires rub on the fender wells when you turn hard left or right (a Volvo mechanic assured me this was normal) and Volvo put a metal rub plate on the fender liner to compensate! Good luck on your quest, if you're unlike me (and most people are) your choices won't be limited by having to shift your own gears, so you should be spoiled for choice. The URL of Marve's writeup says it all, to me. Thanks for sharing Marve! I concur on the turning circle; it isn't good, at all. I'm used to it and just don't ever turn (no NASCAR for me!). Like Chuck Norris, the earth turns on MY axis. But I'm sure it would bother lots of people. I can't believe there hasn't been a single comment about the spiciest (and the only VW) vehicle on my list. What sort of enthusiasts are you guys? I mentioned the Cayenne up above.....my wife has one....love it. It would move immediately from "wild hare" to primo on my list. We've put 75k miles on it with (knock on wood) so few issues it's not funny. Additionally, it's a better tow vehicle than my father's Suburban. Nothing but good things to say about it---if you have to own an SUV, it's one of the most rewarding ones to own I can think of (followed closely by my long departed BMW 4.6is). Thanks for the follow-up, FTB! I forgot that you did exactly what you said. I forgot the C-class wagon. Something else Gianni is that you can lease many used cars through your bank. I have a friend who leases everything. Right now he has a 4 year old Auchi A3 with a 2 year lease. Also forgot the BMW X6, but I prefer the 3 or 5 Series Gran Turismo X-Drive. Get smaller dog crates, or maybe a pair of Yorkies! MPG? Oh well - ok for weekend trips by me. Didn't, for the reasons you listed. I was fixated on a 2006 Subaru Forester XT turbo also, but they have such issues with the turbo engine--specifically, the oil inlet getting clogged (that little screen) at about 120k, which starves the turbo of oil, and the turbo then disintegrates and shards of metal destroy the pistons and the insides of the engines. I looked at a couple, all with 150k+ except one, which had been wrecked. Instead, I got a 2006 Volvo V50 T5 wagon, with 4WD, 220hp, power everything, great 5sp auto, stiff handling, 26mpg highway...and good looks (although it rides too high). The car pulls well, especially at highway speeds...and does what I need it, all year long. When I want to go faster, I drive the M3. Mrs. G took the list of about 100 cars that y'all came up with and narrowed it down to about 17 that she would consider. So on Saturday we planned to go to the Subaru dealer to check out the Outback and Forester and to the Mazda dealer to check out the CX-5. On the way she spotted a Toyota Venza (or as I call it the Vincenzo), which she didn't know what it was. What's that? Does it come in AWD? As it turns out, the Toyota dealer was on the way to the Subie dealer so we stopped there first. We looked at and drove a 2013 top of the line Venza with 23k on the clock. It had a nice cushy ride and was deceptively quick. She liked it, especially compared with her old van with no high tech extras, but she didn't like the lack of rear vision and also it didn't look like the dog crate would fit in the back with the sloping glass hatch. It also had factor 20" wheels on it. Why? They also had a used RAV right next to it with 8K on the clock that we looked at, but didn't drive as she's not ready for the empty nester mobile. It seemed much tinnier. Also nearby was a used MDX (This SUV is too big said mama bear). Also they had a base Forester with a manual and a year old Outback. They seemed like they would work size-wise, but we wanted to go to the Subie dealer to drive them. On to the Mazda dealer: The salesman at the Toyota dealer was cool. The Mazda sales dude gave me a headache with all the talking. I had to go home and take a nap after. Anyway, we drove a top of the line 2016 Grand Touring with 19"'s on it - again what's with the big wheels! We both thought it felt more firm and sporting for a big vehicle vs. the Caddy ride of Vincenzo. Mrs. G also liked the visibility and higher driving position. It didn't seem like it lacked any power. The one question was if it would fit the dog crate in the back. Silly me, I took the crate out and wrote down the dimensions but didn't bring a tape measure. Fantastico! Sounds like you guys did some good detective work. Gianni - sounds good, keep us posted!! This might be the first time that a mid week match-up was potentially helpful to the victim...errr...I mean test subject. My family struggles with the family car topic too -- 3 small kids and we are sticking with sedans and a Rav4 for now, but to help haul friends/family around we really need a dang minivan. Wife is fighting against it, but it is only a matter of time. You know....I didn't really calculate hybrids in. Oops. I forget where you are but this is what I found in the Seattle area. 2008 Ford Escape Hybrid with 41K for $20K - I have a love/hate view of the Escape in general (more on request, if you're interested) but you're looking at 29 mpg city! @DT - the Minivan takes so much stick, but man, they haul. With the 2nd row of seats out, I've hauled 8 ft 2x4's 4x8 sheets of plywood and a Yamaha DT 250 on its side. With the 2nd row in we can get both do our road bikes in, 2 dog crates or an XR80. Try that with an SUV, there's not much Mini in minivans now days. @K2 - we are in a 'burb about 10 miles North of Seattle. Didn't think about Hybrids either. Minivans rule. I don't care what anybody says. They DO. They're the most utilitarian, best driving (it's the COMBO people!) cars on the road. My biggest problem with a used Sienna is that they hold so much dang residual value. Almost twenty large for 10 year old used Toyota with 76k on the odometer? This isn't a Ferrari. If I am going to buy a 10 year old used car, it should be maximum 1/5th of its original MSRP. Like this 750iL. Now I start comparing that Sienna to a brand new Kia Sedona for only a $6k more that includes the latest connectivity, nav, warranty...etc. See my problem? Its call attention deficit...hey let's go ride our bikes.. So I've been looking at CPO cars. I've noticed a few have been rental units in their past lives when I VIN check them. I have my bias against rentals, but is that just my inner gear head talking (it's a rental, drive it like you stole it)? Do mere mortals drive rentals the same way they drive their DD Camry? Gianni- I've sold MANY rental cars over the years and have to tell you they were always the most desirable units to sell by any of the salesmen because: they are impeccably maintained. They are checked over after every driver returns them! That doesn't happen with privately owned new cars anymore. I dare say there are a lot of people who drive only 10,000 miles and turn the car in for the next one and they've never known where the dipstick is and have never changed the oil in the car. Based on my past experiences, I would preference a rental car over any other if there was one available in the model I was looking for. I drove rental cars for several years and yes, when I raced for a Cadillac that had a V8 in it I would absolutely drive it to see what it had in it, but gone are the days of being able to rent a Shelby GT350H and taking it to the track. If one is in an accident or if it has a bad service history, it will show up on the carfax. I don't have anything concrete to add to what Hunsbloger said. His are words of authority. My gut is exactly what you said, Gianni; I'd be hesitant. But again, what Huns wrote makes a lot of sense. I also wouldn't personally buy from a dealer, so CPO is out for me. It mystifies me why I'd pay more for the same car from a dealer over a private party, assuming I can find a suitable car from such a source. I know that means DTers are going to jump down my throat, so GUYS read what I just wrote! Suitable is the key word there, not some random deal done in a back alley somewhere. Plus, you can buy extended warranties on just about any car nowadays. Are they as good? In some cases yes and some no. Just like buying a car, you'll need to do that research. Again, I never buy these things so I'm not an expert. But my V70 and our MPV came with an extended warranty that the previous owner bought that pretty much covered (seemingly) everything. I never used it so it went untried and untested so I don't know how well they covered things that went boom. Just a thought. But I think you should trust your gut, Gianni. There are plenty of cars out there for you to choose from so why settle? Your last line is the most important "trust your gut". Regardless of anyone else's experiences or wisdom, your gut is what will determine whether you enjoy your car or not. If you have any lingering doubts when you purchase a car, those doubts become little "I told you so's" that you can't run away from fast enough once its your car. I used to tell salesmen, if you're having to push a deal, you're on the wrong car or something is missing. At the end of the deal the customer should be thrilled with the outcome. I sure enjoyed "Blink" by Malcolm Gladwell. Anybody else read it? Good point on the maintenance. A 1 private owner car with 25k on the clock probably only has one oil change under its belt. Don't forget (like I always do) that we're not in the 80s or even the 90s anymore. Cars don't need an oil change every 3K or 3 months, whichever comes first. I still find myself struggling with the urge to change the oil too soon these days. Perhaps, but I'm still willing to debate till I'm blue in the face that 7500 miles is the LONGEST interval one should use, synthetic, dino, or whatever. These extended intervals almost always coincided with the introduction of "included maintenance" for new vehicle purchases, with the result being a whole generation of cars with 100k mile lifespans. For example, on a BMW the interval didn't change because oil could suddenly protect well up to 15k miles, the interval changed because it was now on BMW's dime. Gianni, blast my lack of attention to detail, I completely missed your dimension question from the 13th. Probably a moot point right now but from my measurements, a box with the dimensions 24"W x 36"L x 27" H will not fit. Sideways in the cargo area it'll fit length and width-wise with the hatch open. However as you go to close the rear hatch, it will hit the hatch glass. 24" from the rear seatbacks and 27" from the load floor, where the aft-most corner of the dog crate would be, is a point in space approximately 2" outside of the rear hatch glass with the hatch closed. Of course, if your crate tapers at the top and you can squeeeeze it against the rear seatback, you might have a fighting chance at getting the rear hatch closed. The V70 subject of this article probably has much more usable cargo space thanks to the near-vertical rear hatch and cargo-area side windows. Ugh speaking of lack of attention to detail, the above comment is in reference to the Mazda CX-5. You should see the faces of diesel mechanics when they drain the oil on a truck that's been running natural gas instead of diesel. That's obviously an extreme example but the older my cars get, the more frequently we take them in for oil changes. But then again, I'm a strong adherent of Mark Twain's theory regarding whiskey and toothaches: "I always take Scotch whiskey at night as a preventive of toothache. I have never had the toothache; and what is more, I never intend to have it.” Hard to prove what not doing it causes. I do 5K or 12 months on all my stuff - synth or dino. My belief is the 10k - 15k intervals are driven by the manufacturers, offering free maintenance on mainly leased vehicles, trying to keep their costs down. LOL...you posted yours as I was typing mine. So here's an update in case anyone still cares. We went to the Subaru dealer near my office on Friday and looked at a 2013 Forester and a 2014 Outback. We didn't drive the Forester, it felt like a tin can. The doors closed with that tinny ring. The redesigned 2015 Forester was in the showroom and it feels more substantial, but we aren't interested in new. We drove the 2014 Outback, it was a top of the line, fully loaded model with about 10K on the clock. The Outback has gotten big! The sales guy parked it next to her Sienna and it was not much smaller. She liked it, but thought the CVT felt weird on the test drive (this dealer advertises no salesperson test drives - they should all move to that model). I drove it and thought the steering was 'sticky'- I don't know how else to describe it - felt like taking the lid off an old honey jar. The CVT felt odd and it was a floaty over some yumps on W. Lake Sammamish parkway. So, she's thinking about it. It's down to the CX-5 and Outback. I'm pulling for the CX-5. I think it looks the best and drove the best by a mile. Most like a sporty car. The search continues for the holy grail! Time for the final entry. We bought a lightly used 2015 CX-5 this weekend. Mrs. G is happy, so I'm happy! The only downside is that my MINI has been kicked out of the garage. Congratulations!!! I hope the CX-5 lives long and prospers. Time for a home loan to expand that garage.